An app for conscious consumers to understand where and how their apparel is made. I worked collaboratively on a team of 3 UX designers on the research, ideation and design of this conceptual app. Who Cares About Apparel Sustainability? My starting point was to understand who our target audience was and what their collective goals, motivations and pain points were for finding information about their products. They care about "doing their part" and want to choose sustainable products but it’s not always top of mind. They want to know how specific products impact them directly - their main concern is the health and wellbeing of themselves and their families. They have a desire to know more about the brands they buy from and what their values are. It’s difficult to find information on how their products are made. The information available is either too technical and dense or oversimplified. They can’t care about what they don’t know. They have a desire to do more, but they don’t know what “more” means. From there, we created a user persona to provide further context for our research and drive the primary focus of the app. The Value For Sustainable Brands? We also spoke with spoke with brands that publicly practice sustainable supply chain production such as Industry Of All Nations, Vamvas, REI and Patagonia, some of whom are affiliated with the SAC and some who were not. During my interview with the Sustainability Initiative Manager at REI, I asked her about the value of being positioned as a “sustainable brand” so that we could understand the brand perspective and the value that an SAC affiliation (and our app) could offer. REI's focus was environmental . They believe that a healthy outdoor lifestyle requires a healthy outdoors. Other brands, such as Vamvas, were less focused on environmental perspective and more on the relationship between the brand and the consumer. Our research insights directly impacted the features we included in our app and the way we organized and displayed our information. We knew the main challenge would be to present product information, quickly, clearly and concisely. We also knew that visuals are instinctive ways to guide people through dense information and we wanted to incorporate a strong visual language into our app. We performed a sustainable vocabulary and iconography test to check the familiarity and understandability level of key icons and terms that we could potentially include. We went through several iterations of sketches and wireframes. We knew we wanted to incorporate scan and RFC features so that consumers could use the app while they were out shopping to help inform their buying decisions. We also wanted an overall sustainability score for the product that would be derived from the Higg Index data. I went through several variations of how this score might be visualized. 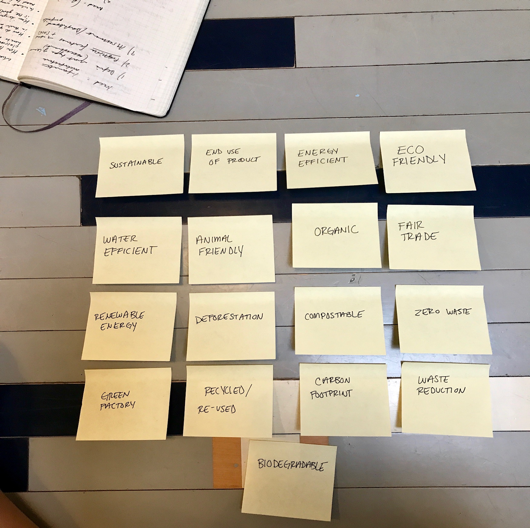 In addition, I knew that there should be a way for us to differentiate between a specific product's sustainability and the overall brand's sustainability and thought of some ways we might communicate this in my sketches. We finally arrived at a layout that included 3 main sections of information: an overall sustainability score, specific information about the item such as material composition and longevity, and finally information about the brand's sustainability practices such as fair trade at a factory level and end-of-use policies. 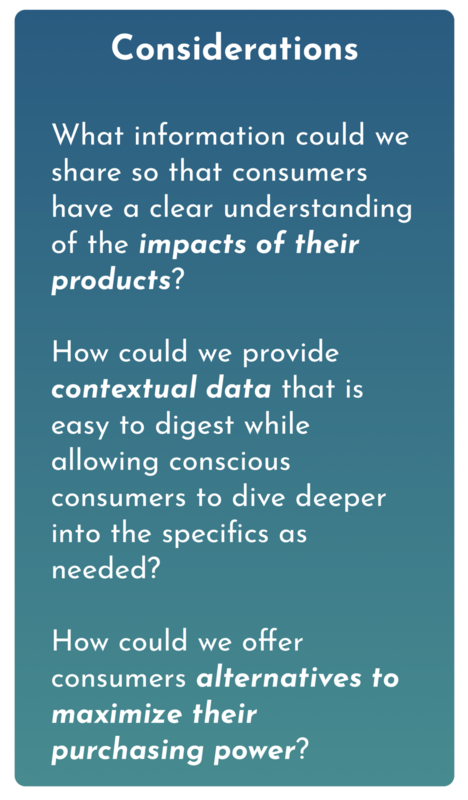 To further validate the research and assumptions we'd made so far, we put together a quick paper prototype and tested it on another set of conscious consumers. We learned that while our iconography was clear and readable, users wanted to have more explicit calls to action in some instances. We also learned that users wanted the option to save sustainable alternatives that they viewed and to know the location of those alternatives. Before moving into high-fidelity wireframes, we put together an overall look and feel of the app. We chose a warm, off-white background to convey an organic feel and complimented this with pops of green and blue to give off an earthy yet modern vibe. My partners and I tested our prototype on another set of conscious consumers. From there, we gathered feedback on the functionality, visuals, and the overall concept. Users wanted the ability to move back and forth within screens more easily, and to know more about the product and brand before being offered sustainable alternatives. Thinking about the context in which our users would use the app helped me keep the end user in mind. Users can scan an item's barcode, or select NFC scan. Users can quickly see the sustainability score of an item they've scanned. A link to how this score is calculated (The Higg Index) is directly beneath the score. Information about the specific product and the brand are also shown. Users have the option to view sustainable alternatives if the item scanned received a low score, or other similar sustainable items if the item scanned received a high score. Users can see the direct impact they've made by purchasing sustainable items. They would also be able to favorite items and view past scans.